'Til the cows come home. 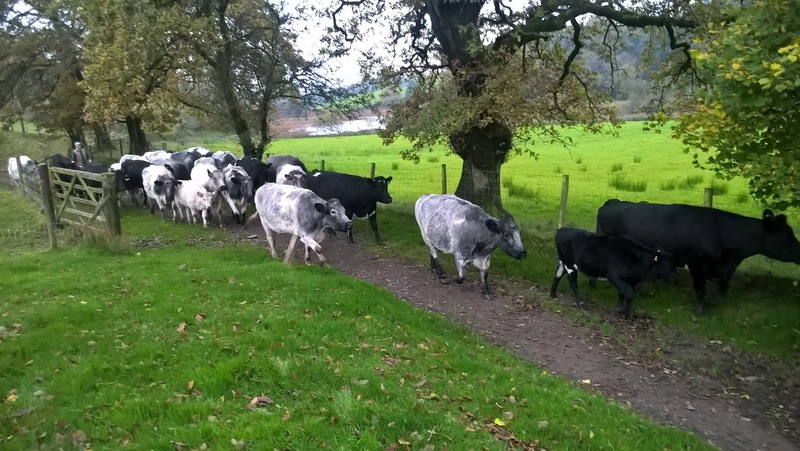 The National Trust Scout Beck herd of the rare Albion breed were brought in today, Sunday 15th, from their grazing land to High Lickbarrow Farm. From here they were transported to their Winter quarters. Along with the cows there were 17 calves born earlier this year in May. The remnants of Hurricane Ophelia are due to hit on Monday 16th so the timing was just about perfect! 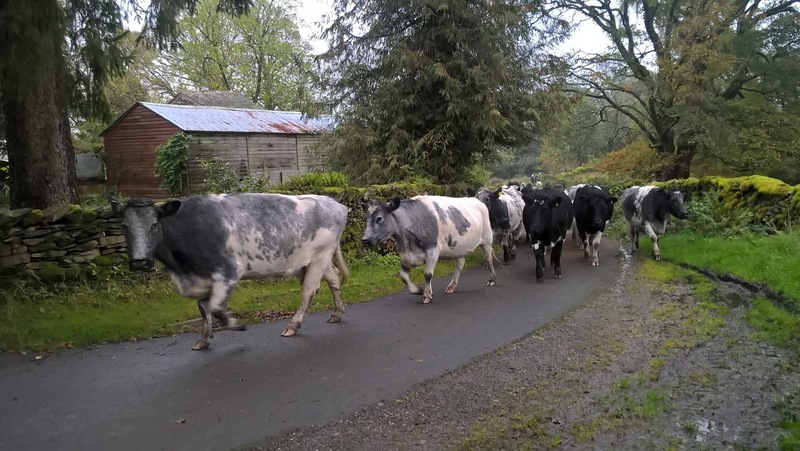 Six helpers including 3 National Trust staff herded the cattle along a kilometre route to the farm. It all went pretty smoothly with only the occasional break away attempt. In this image the cattle are approaching the entrance to High Lickbarrow in orderly procession. 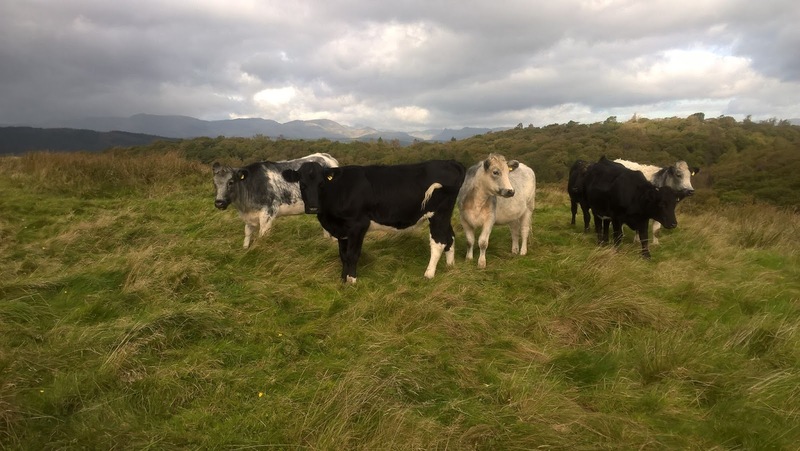 These "first" heifers (about 18 months old) were brought in a week earlier from their grazing allotment at Moor How, near Newby Bridge. ...and here she is at High Lickbarrow on her birthday in May 2016! Just a few hours old! The herd will return to their 'home' at High Lickbarrow in May ready for a new season. 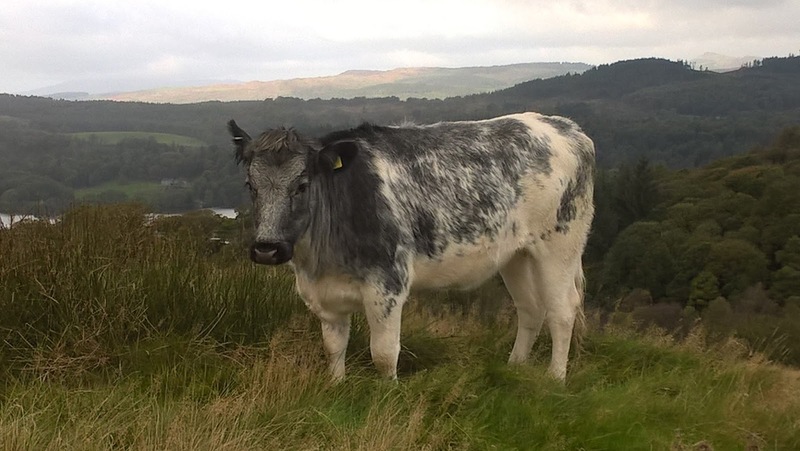 Some animals have been sold to farms in Cornwall and Derbyshire which will contribute to improving the bloodline, and increase the numbers of this rare breed. 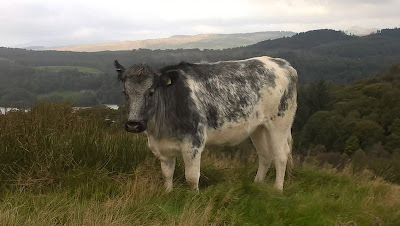 To find out more about the Albion breed...The Albion Cattle Society have a website that is very informative. "....dedicated to raising public awareness of this dying breed and help save it from extinction". On Wednesday 27’Th of September a trial Red Squirrel walk and talk was held at Aira Force. 43 eager and excited years 1&2 children from Stainton Primary school arrived at Aira Force, where they were treated to an interesting and informative talk by Andrew and Julie from the PDRSG. Once the children’s brains had been filled with all sorts of exciting squirrel facts they where taken on a tour of Aira Force by the National Trust Rangers, in hope of seeing one of our little fury friends. We looked high we looked low but sadly we did not see one. We believe we have about 6 pairs in Aira Force, unfortunately they didn’t want to come and play that sunny Wednesday morning. The best time to catch a sighting of red is often at dusk or dawn when it is quieter and there are less people around. All the children had fun though filling in there Red Squirrel trails as they walked around the path ways of Aira Force. Once we had completed the tour, the children where then treated to a ride on the Ullswater Steamer from Aira Force to Glenridding, where they were each given a goody bag packed full of Red Squirrel memorabilia. these talks will hopefully become a more regular event next year.